This is the first book in a series of books revolving on the main character, Max. Max always seems to get the short end of the stick. His older brother, Charlie, is perceived to be perfect. In the first story, the siblings are invited to the wedding of their Uncle Dan. But before the vows are exchanged, Charlie lures Max into a trap that ends with his falling out of a tree and disrupting the wedding. Things further deteriorate at the wedding reception, when Charlie attracts the flower girl, Lucy, who Max adores. Charlie becomes a partner in crime with the bartender and Sophie’s three brothers who conspire to booby trap the marriage getaway car. To make matters worse, Max’s evil Aunt schemes to get Max into trouble. Of course, Max finds devious ways to get his revenge. 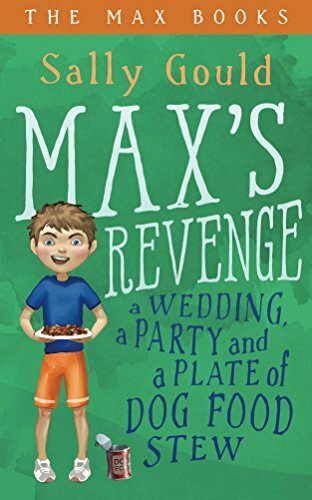 Children in grades three to six will find themselves empathizing with poor Max. Perhaps they have a relative like Max’s evil Aunt. The comedy is spot on and the dialogue appears genuine and age appropriate. Length of the stories is not too long so the book will appeal to reluctant readers. Perfect choice for a summer read. I’ve heard good things about this series! Thanks for linking up at Booknificent Thursday on Mommynificent.com! I plan on looking into other books of the series as well.